PBA DC-3s: WHERE ARE THEY NOW? Provincetown - Boston Airline was the most famous of the later day DC-3 operators and flew 12, mostly pre-war examples of the type. More than three decades after the last PBA DC-3 flight in September 1988, 11 of these aircraft still exist in some form and the fate of one is uncertain. Many are still flying with private owners while several will never fly again. If you have any updates on any of these aircraft, please contact me! Painted in Continental's 1950s color scheme, it is currently on display at the Lone Star Flight Museum in Ellington, Texas. After the former museum location in Galveston suffered heavy damage from Hurricane Ike in 2008 it was decided to move the facility and aircraft farther inland to Ellington Airport near Houston. A Facebook video from March 2017 shows the engines being started for the first time in several years in preparation for the 30 mile flight from Galveston to the new facility. Frank Dalpe took this photo of N25673 on display at the Lone Star Flight Museum in Galveston on August 8, 2015. This spectacular photo was taken by Jason Knutson in 2005. 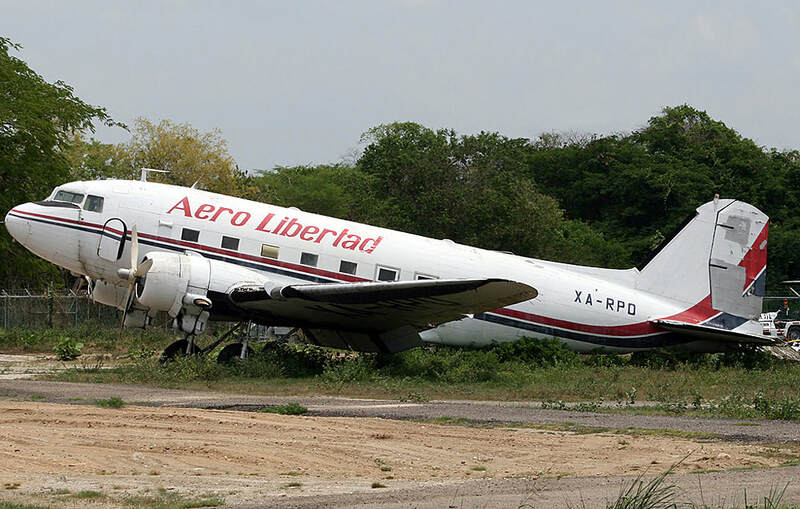 Although it was flying passengers with Aeroejecutivos as recently as 2003, "Caballo Viejo" now sits at a remote ramp in Ocumare del Tuy, Venezuela (SVMP). The first photo was taken by Ricardo Coppola in 2006. It was rumored that a group was trying to raise the funds to restore it, but this has yet to happen. Left: Google Earth view from December 13, 2014 shows the former N31PB missing ailerons, elevators, and possibly the rudder. Judging from older Google aerial photos, the plane has not moved since 2004. 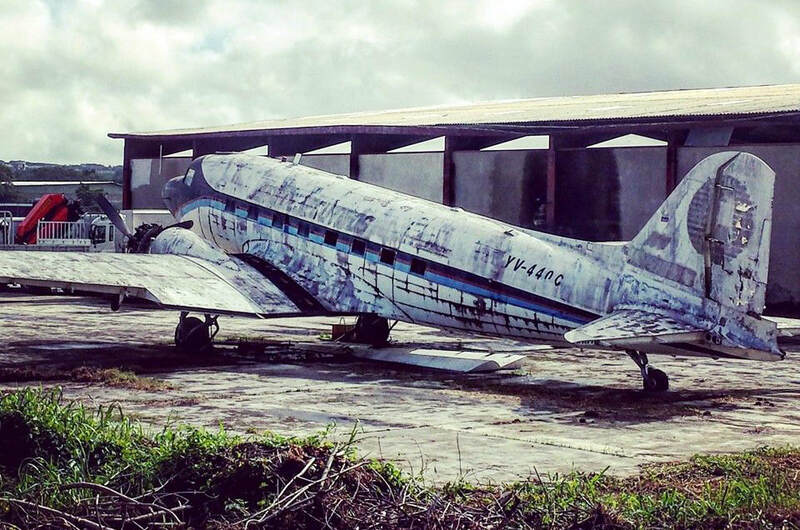 A more recent view confirms the deterioration and raises serious doubts that this aircraft will ever fly again. This aircraft was donated to the Plattsburgh Aeronautical Institute by Champlain Air in 2005 and has since been used for aviation mechanic training. Plattsburgh Airport was closed in 2007 and old N32PB presumably will not fly again although it remains essentially intact. 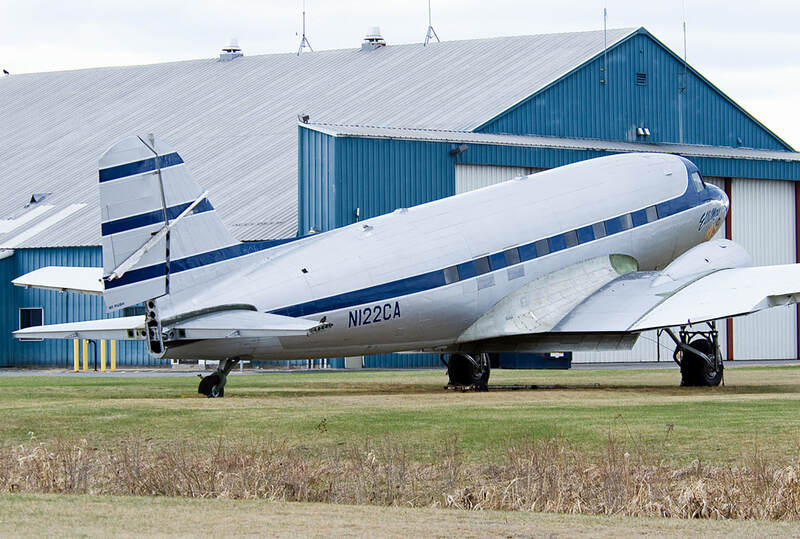 N122CA is pictured at Plattsburgh on April 26, 2015 without engines, ailerons or elevators but seems to be in good overall condition. Photo by "Dutch" via JetPhotos.net. When Chris Coates visited Plattsburgh on January 5, 2008, former N32PB was without wings, tail and engines and the gear was retracted..
N33PB was sold to the Venezuelan airline Aeroejecutivos in April 1986 and registered YV-427C. By the early 1990s it was no longer registered and its fate is unknown. In December 2011 I received this message from Woody: "After Sekman Aviation got the STC to install their cargo door modification, it was sold to Aeroejecutivos at SVMI (Simón Bolívar International Airport of Maiquetia). Around 1991 or '92, I heard that it was wiped out in a ground loop accident in the remote interior of Venezuela." After PBA shut down, N34PB remained parked until 1992 when it was purchased by Champlain Air. The aircraft was registered it N922CA and underwent a complete restoration. Francisco Agullo and a group of friends bought the airplane in November 2008 with the intention to fly it in Europe. The DC-3 was flown to Switzerland in Spring 2009 and registered as HB-IRJ. 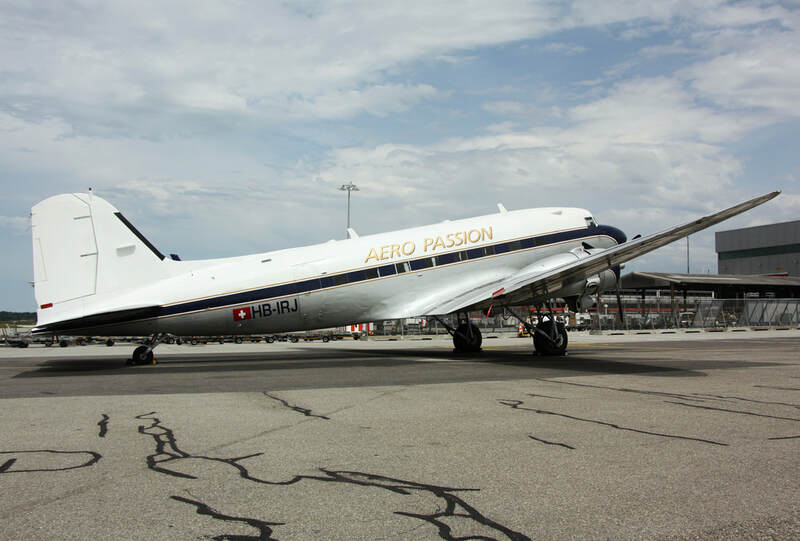 It has been operated by the Super Constellation Flyers Association and was sponsored by Breitling for many years. 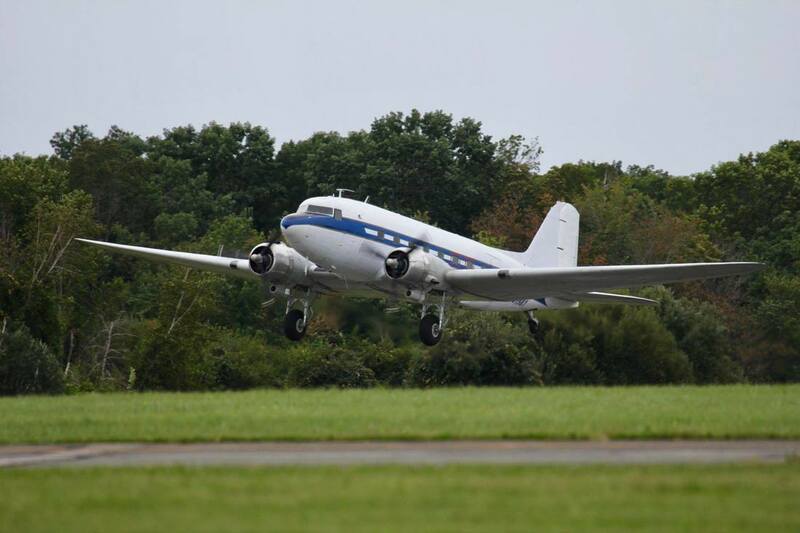 The aircraft made history in 2017 when it became the oldest plane to ever circle the globe during the "Breitling DC-3 World Tour" which began on March 9, 2017 (77 years to the day since its first flight) and ended September 17, 2017. I've posted some of their spectacular photos from that journey HERE. Stunning photo taken above Mount Aso, the largest active volcano in Japan, on May 2, 2017. Photo courtesy of the Breitling DC-3 World Tour Facebook page. The Breitling DC-3 in Switzerland on August 25, 2010. Photo by David Levain. This DC-3 was originally delivered to American Airlines in 1940 as a Douglas Sleeper Transport. After having spent many years on the Basler ramp in Oshkosh, it was purchased by Chris Siderwicz and flown to Cape Cod Airfield in Barnstable, Massachusetts on August 5, 2015. 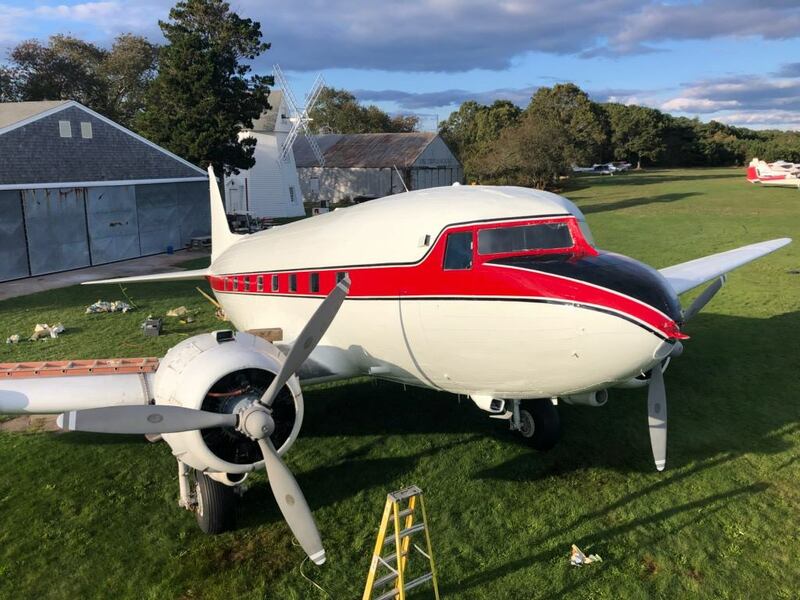 N61981 was one of the star attractions at the 2018 Beverly Regional Air Show in Beverly, Massachusetts on September 8 and 9, 2018. Their website advertised, "Go back in time while sitting in the back of a Douglas DC-3 for a 30 minute cruise around northeastern Massachusetts for only $80 per person!" Thanks to Ron Shusterman for this great photo of "old 35" taking off from Beverly during the air show. 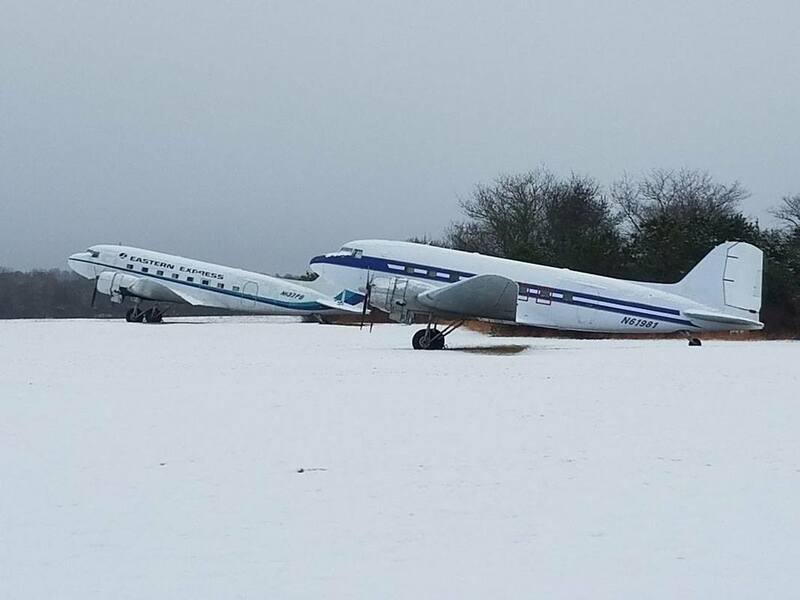 Rick Whittle sent in this beautiful photo of former PBA DC-3s N137PB and N61981 (formerly N35PB) in the snow at Cape Cod Airfield on January 17, 2018. Thanks to Pete Johnson for these next two photos! The interior of former N35PB looks great! August 5, 2015. Photo courtesy of Pete Johnson. The pride of the PBA fleet and the highest time airliner in the world during the 1980s, "Old 36" is currently owned by Aerometal International in Aurora, Oregon. Current total airframe time is in excess of 91,500 hours... more than 10 years in the air! Jimmy Vach, son of PBA vice-president Jim Vach, sent video of the aircraft flying over Wilsonville, Oregon on September 18, 2018. Nigel Hitchman took this stunning photo of N18121 at Aurora, OR on September 5, 2018. Another photo of super shiny N18121 during a training flight on September 5, 2018 courtesy of Nigel Hitchman. N18121 had previously been located at the Pearson Air Museum in Vancouver, Washington and for many years was painted in the classic "The Great Silver Fleet" colors of its original owner Eastern Air Lines. Photo taken at Oshkosh on July 26, 2010 by Graham Evans at Air-Britain Photographic Images Collection. After the demise of PBA in 1988, N137PB spent more than 2 decades parked at Fremont, Ohio (14G), registered to the Northern Illinois Aircraft Museum. After the owner passed away, the aircraft was sold, returned to airworthy condition and flown to Thomaston, Georgia in 2014 where it remained for over two years. On May 4, 2017, N137PB, still adorned in the late 1980s colors of Eastern Express, departed Thomaston for its new home at Cape Cod Airfield where it joins another former PBA DC-3, N35PB (now N61981). In late October 2018, the aircraft was repainted in basic 1970s PBA colors minus the titles and logo. Here it is on October 24, 2018 with one side freshly painted in red, white and black. The control surfaces are in the process of being recovered. Photo credit: Chris Siderwicz Jr. via Pete Johnson. Thanks to Richard Hancock for sending in this fantastic photo of N137PB departing Thomaston on May 4, 2017. N137PB at Thomaston, Georgia on May 24, 2015 at Thomaston, GA. The props were back in place a month later. Many thanks to Norbert Raith for this photo! Two former PBA DC-3s reunited! N28AA, formerly N139PB, poses with N137PB at Thomaston, GA on June 29, 2015. Photo courtesy of the Candler Field Museum. N137PB is the last DC-3 to still retain the original PBA / Eastern Express passenger cabin configuration. This photo came from the Fremont Airport Facebook page in May 2010. Presumably the interior is still intact. I flew as a passenger on this aircraft between Miami and Marathon in December 1981 and it's a joy to see this in such good condition. MSN: 2137 Mfr Date: May 16, 1939 Last known reg: XA-RPE Location: Tulsa, Oklahoma in American Airlines hangar 4D Status: May soon be scrapped with the cockpit being restored for museum display. Originally delivered to American Airlines as "Flagship Tulsa", this aircraft flew with Aero Libertad in Mexico for many years after its time with PBA. 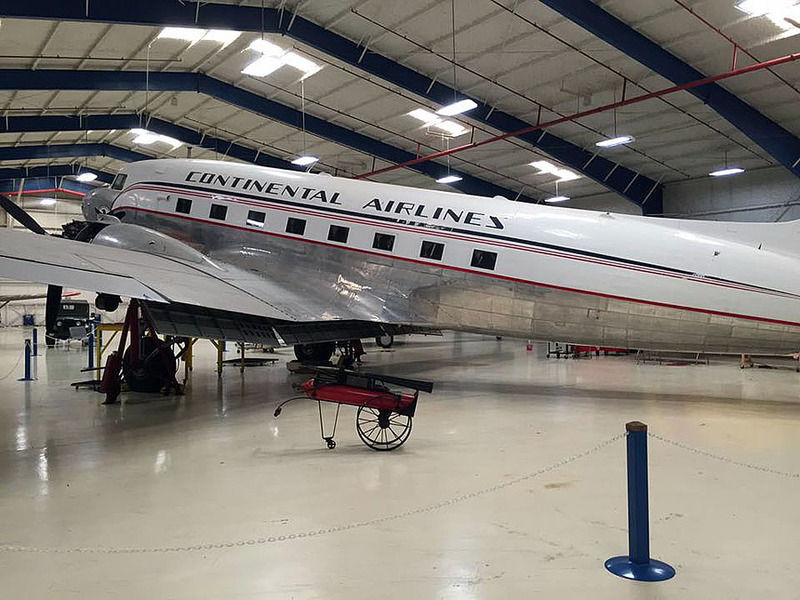 By 2009 it had been trucked to American Airlines' hangar 4D in Tulsa, OK to undergo a full restoration. (Photos of the restoration process can be found in the photobucket account of tulsaboy.) Unfortunately, things did not go as planned. Jim Gentry, who worked on the restoration, reported on August 2, 2015: "The airplane was worked on for some time but it became apparent that the corrosion was just too severe to continue. We are going to redo the cockpit and cut it off aft of mail door for display in the Tulsa Air and Space Museum". For a very detailed pictorial history of this particular aircraft CLICK HERE. Jim Sells owns N28AA and flies it regularly to air shows and locally from Peachtree City, GA. It is also a common sight at Thomaston, GA (cheap avgas) and the Peach State Aerodrome (good food) near Williamson, GA.
Below: On October 13, 2018, N28AA transported a full load of supplies to Panama City, FL in the wake of Hurricane Michael. The very next day it was on display at the Wings Over North Georgia Air Show in Rome, GA and was spotted at Thomaston, GA on October 18, 2018. N28AA making a low pass at the Peach State Aerodrome on August 25, 2018. Image source: Peach State Aerodrome Facebook page. Ron Alexander owned this aircraft for 25 years and flew it in a variety of roles. It served as a promotional aircraft for his various companies; was used for flight training; was a popular attraction at air shows; it appeared in several major motion pictures and even hosted an in-flight wedding. After flying with Aero Libertad in Mexico, XA-RPN had been parked at Basler Turbo Conversions in Oshkosh since the 1990s. In early 2015 it was trucked to Shell Creek Airpark near Punta Gorda, FL to provide parts for the restoration of N133D, the oldest existing DC-3. This sad sight was captured by Jannik Femmerling on May 26, 2015. The front end of former N40PB seen in November 2016. Photo courtesy of Michael Prophet. XA-RPN at the Basler Facility in Oshkosh, Wisconsin prior to move to Florida. Sometime around 2013, the former N43PB was given a wild psychedelic paint job complete with a lizard face. Photo taken March 4, 2015 by Sibille Regis. Here she is on June 15, 2011 before her makeover. Photo credit: Jonathan Parra. If you have updates or photos of any of these aircraft, please contact me!